"The earth has a secret it needs to tell." ACTUAL DOCUMENTED ACCOUNT: A hacker's work leads Mulder to alien bodies in a train car buried on a reservation. REVIEW: After a number of subpar episodes, Anasazi returns to the mytharc with a vengeance and crams half a season's worth of story into 45 minutes. That's not really a complaint about this episode, mind you, but rather more about the number of extraneous episodes there are in a traditional season on American television. But we can see why previous episodes tried to save some money. A boxcar full of mummified aliens buried in a British Colombian quarry painted red half a mile across so it would look like New Mexico, well, that couldn't have come cheap. (Too bad about the pine trees and post-war Canadian housing on the Navajo reservation; there's a real mismatch there.) Anasazi also has lots of recurring characters criss-crossing, including the Lone Gunmen, Skinner, the Smoking Man, Mulder's father, and Krycek. It's the season finale and everything feels writ large. A lot of questions are asked and we'll have to wait for the resolution to answer at least of them (thankfully, these reviews never go on a 4-month hiatus), but the biggest of these is what Mulder's father has to do with the Conspiracy (or the branch that will become known as the Syndicate). The alien files are found/hacked, and suddenly the Smoking Man is getting the phone call he never wanted to have. It seems to be a burn order - burn the evidence, burn everyone who might be implicated or prove a liability - and we see him get that call at the end of an international chain of speakers. This is bigger than the U.S. government. It's Illuminati level stuff. And if the Smoking Man gets a chill from it, imagine how big this thing is. But if he's not working with who we thought he was exactly, that might go double for Krycek. He turns up to assassinate Mulder's father, but the Smoking Man tells Mulder he, himself, wasn't responsible for that. Does the Syndicate not trust the Smoking Man's soft touch? His loyalty to Bill Mulder seems apparent and goes as far as protecting Fox whenever possible. X is called but doesn't show up, so has THAT side of the Conspiracy decided to burn Mulder as an asset? Are THEY employing Krycek now, and might he always have been a double agent? It's even possible the people who killed one Mulder and attempted to kill the other are different from those who were slowly poisoning them with psychotropic drugs. 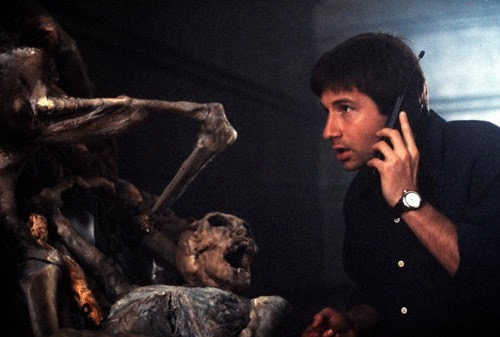 And while we're asking questions, who stores valuable alien bodies in a buried boxcar? Are they really aliens or hybrids? And where does Mulder disappear to when the Smoking Man torches the thing? Oh, and what do the Navajo-coded files say about Scully's own abduction? The more you question, the more you doubt the evidence of your eyes, and that heightens the show's paranoid atmosphere. The tension is also artificially raised by Mulder's erratic and violent behavior, literally so since it's caused by hands unknown inserting something into his building's drinking water (it even causes a rage-murder one apartment down). Mulder turns into a hockey goon on Skinner (I love it when Skinner gets physical, he's a real powerhouse) and later needs to be taken down by Scully (though that lets Krycek escape, so I'm not sure it was the best play - actually, I'm dead sure it wasn't). Éí 'Aaníígóó 'Áhoot'é: So what did Mulder's dad DO as a member of the Syndicate? After all, if they're responsible for alien abductions, or at least colluding with those who are, that would mean Bill Mulder let his daughter be taken, wouldn't it? What would his relationship to the hybrid clone Samantha who showed up on his doorstep recently have been? Only more questions, I'm afraid. REWATCHABILITY: High - A dense mytharc episode filled with tension, violence and mystery.